Identification. The name of the nation derives from Lucilinburhuc , which in the local Germanic dialect meant "Little Fortress," referring to a small Roman castle on a rocky promontory overlooking the Alzette River. Location and Geography. Luxembourg is one of the world's smallest sovereign states at 999 square miles (2,586 square kilometers). The triangle-shaped country borders Germany to the east, France to the south, and Belgium to the west. The most important influence on the nation's cultural traditions is its location between the French and Germanic culture realms. The southern two-thirds, known as "the Good Land" ( Bon Pays in French and Gutland in German), has rich sandy soil and one of Europe's major iron ore deposits, the basis of the country's wealth. The capital, Luxembourg City, where one-fifth of the people live, is in the Bon Pays . The northern third, called Eisléck ( Oesling in French and Osling in German), is hilly and heavily forested and contains only 15 percent of the population. Demography. The population increased from 281,000 in 1947 to 420,000 in 1997, a growth rate of about 1 percent per year. Underlying that growth was a dramatic shift in the ethnic composition of the population. The number of native-born Luxembourgers increased modestly from 262,000 in 1947 to 280,000 in 1997, because Luxembourgers have one of the world's lowest fertility rates, but the number of immigrants increased from 29,000 to 140,000. The largest groups of immigrants came from Italy in the 1950s and 1960s and from Portugal beginning in the 1970s. In 1997, Portuguese accounted for 13 percent of the population, Italians 5 percent, French 4 percent, Belgians 3 percent, Germans 2 percent, citizens of other European Union countries 3 percent, and citizens of other countries 3 percent. The percentage of native-born residents declined from 93 percent in 1947 to 67 percent in 1997. Linguistic Affiliation. Language is the most important element of cultural identity for the native-born. Those residents speak, read, and write in French, German, and Luxembourgish (Lëtzebuergesch), switching between them effortlessly. The major newspaper publishes most international news in German, cultural features in French, and classified advertisements in Luxembourgish. The simultaneous use of three languages derives from a combination of historical tradition and economic necessity. Native residents speak Luxembourgish to each other, and that is the first language infants learn to speak at home. Classified as a Moselle-Franconian dialect of German, Luxembourgish was enriched during the Middle Ages with so many French words and phrases that it is no longer understood by Germans. Traditionally, Luxembourgish was rarely written, and no official rules of spelling and grammar existed until they were established by the government in 1984. Older Luxembourgers suddenly found themselves accused of making spelling and grammatical errors. As the major language most easily understood by native Luxembourgers, German is the principal language of instruction in elementary school, although children speak Luxembourgish in the playground. Beginning in the second grade, French is taught as a subject, although instruction is still principally in German. Over the years, French becomes more important and by high school replaces German as the language of instruction, with German limited to specialized courses in language and literature. French is the principal language for government legislation and speeches. Street names, shop signs, and menus are written in French, and it is preferred by the more educated, intellectual elite. French is also the lingua franca used to communicate with immigrants, most of whom already know another Romance language. Although their language is closer to German than to French, Luxembourgers are reluctant to speak German. Because French replaces German as the language of school instruction in higher grades, using German can be taken as a sign of limited education. Also, older Luxembourgers recall the German occupation during World War II, when they were forced to speak German, and have passed on their memories to later generations. However, in their homes, Luxembourgers are more likely to watch television programs in German than those in French. Symbolism. The national motto, Mir wëlle bleiwe, war mir sin , means "We want to remain what we are." That accurately captures the two dominant goals of contemporary society: protection from linguistic or other imperialism on the part of its more powerful French and German neighbors and protection from economic and political instability that would threaten the country's prosperity and extremely high standard of living. The national anthem consists of the first and last verses of the song Ons Heemecht ("Our Fatherland"). Written in 1864, immediately before the nation gained full sovereignty, the anthem calls for peace. The flag has three horizontal stripes of red (on the top), white, and blue (on the bottom). It is virtually identical to the flag of the Netherlands except for a slightly different blue shading (sky blue instead of ultramarine). In the nineteenth century, Luxembourg and the Netherlands had the same monarch. Emergence of the Nation. The modern independent state is a nineteenth-century creation, but national identity developed when Luxembourg was an independent duchy between 963 and 1443 C.E. Sigefroi (Siegfried), count of Ardennes, bought the area in 963 from the Abbey of Saint Maximin in Trier and built a fortress on the site of the Roman castle. The nation's links with Germanic culture strengthened during the five centuries of independence, especially in the fourteenth century, when Luxembourg's dukes also ruled the German-centered Holy Roman Empire and the national territory extended as far east as the present-day Czech Republic. Luxembourg was conquered in 1443 by Philip the Good, duke of Burgundy. That conquest brought Luxembourgers closer to French culture and severed their links with Germany. French became the language of official business and the one preferred by the elite. Luxembourg experienced four centuries of foreign occupation, primarily by Spain, Austria, and France. The fortress was coveted for its strategic position. The 1815 Congress of Vienna, ending the Napoleonic wars, designated Luxembourg a grand duchy, and awarded it to William I, prince of Orange-Nassau, who was also made the first king of the Netherlands. Luxembourg's territory was reduced to its current size when the Congress of Vienna transferred the land east of the Our, Sûre, and Moselle rivers to Prussia and the western half joined Belgium in a successful revolt against the Netherlands in 1830. The portion remaining under William's control was forced to join the German Confederation, a union of monarchies dominated by Austria and Prussia, and to let Prussian soldiers occupy its fortress. Luxembourg gained independence during the 1860s. The German Confederation was dissolved in 1866, and after the 1867 Treaty of London, Prussia withdrew from the fortress and accepted Luxembourg as a neutral country. The final step in the emergence of a fully independent country was the accession of different monarchs for Luxembourg and the Netherlands in 1890. William I (r. 1815–1840), William II (1840–1849), and William III (1849–1890) ruled both countries, but when William III died, his only child, Wilhemina, became queen only of the Netherlands, whereas Adolphe, head of another branch of the house of Nassau, became grand duke of Luxembourg. In 1783, the Nassau family had agreed that no woman would become a monarch, and in 1815, the Congress of Vienna decided to apply that rule to Luxembourg but not to the Netherlands. In the twentieth century, though, Luxembourg had two female monarchs: Marie-Adelïde (1912–1919), who was the granddaughter of Adolphe (1890–1905) and the only daughter of William IV (1905–1912) and Charlotte (1919–1964). National Identity. A strong national identity beyond speaking Luxembourgish resulted primarily from two German invasions in the twentieth century. During World War I, Grand Duchess Marie-Adelaïde incurred the wrath of her subjects by tolerating the occupation. In 1919, she was forced to abdicate in favor of her sister, Grand Duchess Charlotte. A few months later, Luxembourgers voted to retain the monarchy while extending democratic privileges, including universal suffrage. When Germany again invaded in 1940, Grand Duchess Charlotte instilled national unity by refusing to collaborate with the Nazis, instead fleeing to London until the Allies liberated the country in September 1944. The last major German offensive of World War II, the Battle of the Bulge, was fought largely in Luxembourg. Charlotte abdicated in favor of her son, Grand Duke Jean, 1964, and she died in 1985. Ethnic Relations. Ethnic relations are dominated by large-scale immigration from southern Europe. The earlier Italian immigrants are well integrated into society, and many families have hyphenated last names that combine Italian and Luxembourgish names. The more recent Portuguese immigrants are less well integrated, although Luxembourg has not had the level of ethnic tensions seen in neighboring countries. The dominant public space is the medieval fortress built on Bock promontory. Portions remain of Sigefroi's castle built in 963, as well as archaeological evidence from ancient Gallic encampments and Roman outposts. In the seventeenth and eighteenth centuries, when the nation was occupied by the Spanish, French, and Austrians, increasingly elaborate fortifications were constructed on the promontory, and Luxembourg became known as the "Gibraltar of the North." Carved inside the cliff was a fourteen-mile (twenty-three-kilometer) maze of tunnels for underground defense, known as casemates. When the Prussians withdrew in 1867, the fortifications were larger than the city of Luxembourg. No longer serving a military purpose, most of the fortifications were demolished in the late nineteenth century. During the 1930s though, eleven miles (seventeen kilometers) of casemates and some of the aboveground fortifications were restored as parks and museums. The restored fortifications are the most prominent feature in contemporary "skyline" photographs of the city. Homes in the historic, central area are typically narrow two- or three-story row houses. Those originally built for wealthier families are more ornate than those originally occupied by working-class families. Older homes in smaller towns and villages, and newer ones in the suburbs, are free-standing, but relatively close together. Outside these houses are well-kept gardens, as well as space to park cars. 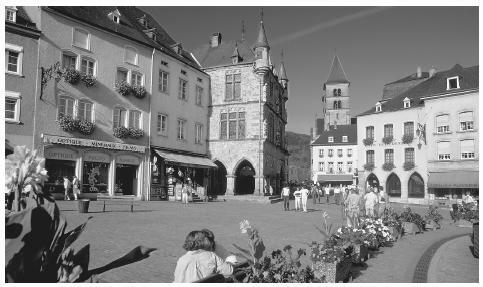 The Echternach marketplace in Luxembourg. Food in Daily Life. Luxembourg cuisine is said to combine the finesse of French cooking with the heartiness of German food. More recently, it has been inspired by the cuisine of Italian and Portuguese immigrants. Traditional Luxembourgers consume a small French-style breakfast and large meals at midday and in the evening. Food Customs at Ceremonial Occasions. Specialties include Judd matt Gaardebou`nen (smoked collar of pork with broad beans), thuringer (small sausages), Luxembourg ham (smoke-cured), friture de la Moselle (small deep-fried river fish), pike in Riesling sauce, gromper keeschelche (potato pancakes), kach keis (soft melted cheese), paté, and quetsche tort (plum tart). Special dishes are consumed on national and religious holidays, as well as on Sunday afternoons. After consuming these large meals, Luxembourgers are fond of taking walks in the country, along well-marked trails. Basic Economy. Luxembourgers have a saying, "Just as Egypt is a gift of the Nile, Luxembourg is a gift of iron." For centuries, the country sat atop a large field of iron ore that contained too much phosphorous to be made into high-quality steel, but in 1877 the British engineer Thomas Gilchrist invented a method of removing phosphorous during the smelting process. Steel production dominated the economy for nearly a century and transformed a very poor, mostly agricultural society into one of the world's wealthiest industrialized countries. At its peak, the steel industry employed one-fourth of the workforce and generated two-thirds of exports, but when world demand for steel plummeted in the 1970s, three-fourths of the steelworkers were laid off. The iron ore fields were closed in 1981, and the surviving steel industry makes specialized products with imported ore. The loss of the steel industry did not plunge Luxembourg into economic disaster. In the 1970s and 1980s, the country became one of Europe's most important financial services centers. Luxembourg had two hundred thirty-three banks in the 1990s—compared with only seventeen in 1960— as well as seven thousand holding companies and 1,300 investment fund operations. Financial institutions were attracted by the low tax rates and strict privacy laws. Luxembourg also houses a number of European organizations, including the general secretariat of the European Parliament, the European Union's statistical and publications offices and court of justice, the European Investment Bank, and the European Court of Auditors. Land Tenure and Property. Luxembourgers place a high value on owning property and the protection of private property rights. Commercial Activities. With the large decline in the steel industry and the growth in financial and European institutions since the 1970s, most citizens are now employed in services. In 1993, 68 percent of the workforce was in services, 29 percent in manufacturing, and 3 percent in agriculture. Major Industries. The major steel producer Arbed (Acieries Réunies de Burbach-Eich-Dudelange) is a transnational corporation with headquarters in Luxembourg City and factories in seven other countries. Somewhat offsetting the loss of steel jobs, several transnational corporations have built factories. The manufacture of chemicals, rubber, and plastic products has increased. Trade. Because of its large number of financial services, Luxembourg has a strongly positive international trade balance. Other European Union countries—primarily the three neighboring countries of Belgium, France, and Germany—account for 61 percent of exports and 74 percent of imports. Division of Labor. One-half of the workers are foreign, about equally divided among immigrants living in the country and commuters from Belgium, France, and Germany. Immigrants hold a large percentage of jobs in construction and minimally skilled services, whereas commuters work in financial services and international institutions. Classes and Castes. The most fundamental social division is between native Luxembourgers and foreign-born residents. Portuguese immigrants are likely to hold lower-status jobs such as street cleaning, bus driving, and restaurant waiting. Symbols of Social Stratification. The major symbol of social class difference is the language spoken and understood at home. Native Luxembourgers address each other and their families in Luxembourgish but switch to French, German, or English to talk with foreigners. Government. Luxembourg is a representative democracy within a constitutional hereditary monarchy. The grand duke or duchess, the ceremonial head of state, appoints the prime minister, who is responsible to a sixty-member Chamber of Deputies that is popularly elected every five years. Leadership and Political Officials. The three principal political parties are the right-leaning Christian Social Party (PCS), the left-leaning Socialist Workers' Party (POSL), and the centrist Democratic Party (PD). The government is nearly always a coalition of the conservative PCS and one of the two more progressive parties. The most influential informal decision-making bodies are three councils: le Conseil d'Etat (council of state), le Conseil économique et social (economic and social council), and les chambres professionnelles (confederation of employers and unions). Former ministers and business, labor, and other civic leaders are appointed to these councils, which are consulted before legislation is enacted affecting their areas of national life. Social Problems and Control. The legal system is strongly influenced by French practice. The highest court is the Cour Superieure de Justice (Superior Court of Justice). Judges are appointed for life by the grand duke. The crime rate is extremely low, and civil disorders are unknown. Military Activity. Luxembourg is an active member of the North Atlantic Treaty Organization (NATO). It spends 0.8 percent of the gross domestic (GDP) on defense and has a volunteer army of about eight hundred active soldiers. About one-third of GDP is spent on social welfare programs; this is one of the world's most generous systems. About half that spending is on pensions, one-fourth on health insurance, and one-fourth on disability payments. With only five thousand unemployed people, spending for unemployment compensation is low. 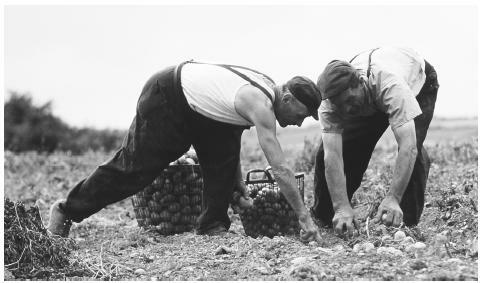 Two men harvest potatoes on a farm. Luxembourgers place a high value on owning property and protecting property rights. developed countries: only 43 percent among citizens and 54 percent among foreigners. Few women are compelled by economic necessity to seek employment, and housework is counted as employment in determining social security and other benefits. Because of the very low birthrate, women citizens are torn between child rearing and working outside the home. The main impetus for the growth in female labor force participation is a desire for more independence and equality and less social isolation. The Relative Status of Women and Men. Older women wield considerable informal authority, in part because they constitute a high percentage of the population: About 12 percent of native-born Luxembourgers are women over age 65. Older women have a large percentage of the national wealth and provide their middle-aged children with considerable financial support, such as assistance in buying a house. In the afternoon, the streets are filled with older women heading for the bakeries to consume coffee and pastry with friends. Marriage. Marriage rates have dropped sharply in recent years. One-third of couples who live together are unmarried, one-seventh of the children are born to unmarried mothers, and one-third of marriages end in divorce. All these practices were rare a generation ago. Domestic Unit. Although the older generation controls much of the family wealth, three-generation households have become much less common than they were in the past. Older women who cannot live independently are more likely to move into expensive, comfortable retirement homes than to move in with one of their children. Inheritance. Inheritance laws do not induce early divesting of an estate to heirs, and so older people hold on to their wealth until they die. Because Luxembourg has had a very low birthrate for a long time, an inheritance is typically divided among a small number of children, but with high life expectancy, most middle-aged and even retired people have living parents. 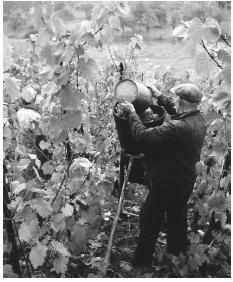 Harvesters pick wine grapes in a vineyard in Wellenstein. mothers who work outside the home. Nearly half the babies are born to foreigners, and they are entitled to the same maternity and day care as the native-born population. Child Rearing and Education. People are taught to be prudent, careful, responsible, and practical. Creativity and expressiveness are not emphasized. An infant is not a constant center of attention, and parents are not obsessed with twenty-four-hour catering to a child's whims. Regular mealtimes and other activities are not disrupted by the arrival of a child. Higher Education. There is no university. Because French is the principal language of instruction in secondary school, Luxembourgers are more likely to attend a university in France or Belgium than in Germany. Luxembourgers regard their cultural values as deriving primarily from their French rather than their German neighbors. However, they do not admire the spontaneity of Latin culture. Punctuality is expected at meetings, social activities, and cultural events. Religious Beliefs. About 97 percent of the people are Roman Catholics. Native-born Luxembourgers are overwhelmingly Roman Catholic, as are most immigrants from Italy and Portugal. Like other European countries, Luxembourg has a free and universal national health insurance system. The public holidays are a mix of Christian and secular dates, such as Christmas, New Year's, and May Day. Luxembourg celebrates National Day on 23 June as the sovereign's official birthday. The night before (22 June) is festive, with torchlight parades, fireworks, music, and parties. National Day is more ceremonial, including military parades, cannonades, and a "Te Deum" sung in the national cathedral. Support for the Arts. The major supporter of the arts is the Grand Ducal Institute, which promotes work in languages and folklore, arts and literature, history, natural science, medicine, and moral and political sciences. Literature. Luxembourg lacks a distinctive literary tradition because of the absence of spelling and grammatical rules and the limited vocabulary and grammar constructions of Luxembourgish. Thus, writers are more likely to work in genres, such as poetry and plays, that are meant to be spoken rather than read silently. The major writers, including the essayist Marcel Noppeney (1877–1966) and the poet Michel Rodange (1827–1876), have invariably used French or German. French books and publications are widely read, and Luxembourg's periodicals, literary reviews, and magazines aimed at intellectuals are almost always written in French. Luxembourgers writing in French are better able to compose essays and scientific tracts than to write novels. Because Luxembourgish is essentially a German dialect, writers in German are able to weave in local phrases and sentiments that are meaningful in Luxembourgish, although "pure" German would discourage such colloquialisms. However, the discomfort of Luxembourgers with the German language discourages its widespread use. Graphic Arts. Luxembourg lacks internationally prominent graphic artists, and its principal museums—the National Museum of History and Art and the Museum of History of the City of Luxembourg—emphasize history and artifacts rather than graphic arts. Contemporary artists are represented at the Musée d'Art Moderne Grand-Duc Jean. Performance Arts. Luxembourg has had a degree of influence in modern communications media. Radiotelevision Luxembourg (RTL), a privately owned company, transmits radio programs in five languages and television programs in French and German. RTL first developed a large audience in the 1960s, when it was the only major station in Europe that played pop music. RTL also supports the major orchestra, the Grand Orchestra of Radiotelevision Luxembourg. Als, Georges. Les femmes et l'économie , 1983. ——. Luxembourg Historical, Geographical and Economic Profile , 1980. ——. Les mutations de l'économie luxembourgeoise , 1983. Barteau, Harry C. Historical dictionary of Luxembourg , 1996. A Brief Survey of the City of Luxembourg , 1982. Christophory, Jul. Who's Afraid of Luxembourgish? Lëtzebuergesch? Qui a peur du Luxembourgeois? 1979. —— and Emile Thoma. Luxembourg , 1997. Clark, Peter. Luxembourg , 1994. Glaesener, Jean-Pierre. Le Grand-Duchy de Luxembourg, historique et pittoresque , 1985. Maertz, Joseph. Luxemburg in der Ardennenoffensive, 1944/45 , 1981. Margue, P., et al. Luxembourg , 1984. Newcomer, James. The Grand Duchy of Luxembourg: The Evolution of Nationhood, 963 A.D. to 1983 , 1984. Newton, Gerald, ed. Luxembourg & Lëtzebuergesch: Language and Communication at the Crossroads of Europe , 1996. This website was GREAT!!!!! I don't know if it could have got any better!!!!! Thanks a lot! I needed help for my French project. Thanks a lot I really needed help on my Social studies project! This was a great website and it helped me a lot on a school project. It had everythine we needed to find. It's a very good source to me... Thanks for the help! Thanks, lots of good info for my World Geography class, hard to find info on Luxembourg. This site was very helpful and I enjoyed the pictures. Especially the ones of the men working. I thought those were very tasteful. the pictures, and the layout of the website itself, were both very tasteful! Luxembourg does have University since 2003 ! its very good source of information about Luxembourg- but please update it ! Darren Shavor : I suggest contacting ARCHIVES NATIONALES DE LUXEMBOURG. Write them an email etc. in English if you do not write/speak French they will have no problem understanding and answering your questions. It's nice to be able to find a comprehensive page of information about Luxembourg, but please update it! The information about secondary school and university is just downright wrong- there is indeed a university, and secondary school is not necessarily taught in French. There are 3 tiers of secondary school- one university prep, one college prep, and one technical school. Mathematics and natural sciences are mostly taught in German, while arts and humanities or social science courses are mostly taught in French. Technical courses are also often taught in German. Additionally, I would have to disagree with a division of social classes strictly between natives and non-natives. Although it is true that there is a division between natives and non-natives, these categories are far too broad. There is a large gap between blue-collar immigrant workers (street cleaners, bus drivers, table waiters, house cleaners, etc.) and white-collar immigrant workers (eurocrats, bankers, businessmen, etc.). Similarly, Natives are divided into the more cosmopolitan and the "bauers" (old Luxembourgish farming families). Furthermore, I would like to stress that although French, Luxembourgish, and German are compulsory at school, that does not necessarily mean that they are mastered. Young adults or adolescents tend to be better at languages, but older Luxembourgish people who have not studied extensively struggle with French and seldom speak English. Even with the younger generation, many Luxembourgish have difficulties with French, and although they can speak it is not very willingly. English is compulsory for some educational tracks, not all, and therefore it is not as widely spoken by natives as your article implies. I highly doubt that the Roman Catholic population still stands at 97%. Although historically the royal family is Catholic, and thus many of the nationals as well, there has been a shift away from religion. Since the collection of data concerning religious affiliation has been outlawed in Luxembourg since 1979, I'm not sure where you're getting this information from or whether you realize how dated this information is. Thanks! My friends and I make OCs for something and a girl is from Luxembourg. We needed history and stuff for her, so thanks! Thanks a bunch :) I really needed information for my Luxembourg ISU for Travel and Tourism :) Thanks again! Thanks for the info! I needed this for a project in French 1 this helped a lot. We would like to find a record of Michel stirn and mary Kaiser that may have lived in Schieren Luxembourg in the 1900. his children were Nicholas mary and henry stirn. We would like to find a record of Michel stirn and mary Kaiser that may have lived in Schieren Luxembourg in the 1900. his children were Nicholas mary and henry stirn. Made a mistake about the Stirns. Michael may have been born in 1821 or 1831 and may have died in U.S. in 1921.They were in Luxembourg in the 1800s not 1900. For the most part, this did help me but I agree with some of the comments about updating it. If any possibility, please include the deaf community of Luxembourg. This helped me indeed. I am doing a French school project and I feel I will visit this website sometimes for more info :) Thanks! This is the best, most helpful website I've found! I have spent enough time in and know enough about Luxembourg to appreciate this websites, thank you. Thank you Jaqueline for your additions and corrections. Collectively a good description of Luxembourg. thanks for the school project help :-) but maybe find out a little more of what they commonly eat. This website helped me to the fullest! Gave me plenty of information about the country I was doing my paper on. Keep up the good work website and keep the information updated. This article is full of useful information! I appreciate how clearly the text was divided into subjects. All of my questions have been answered. Very nice this helped me out alot on my french project! Luxembourg is the best!!! I have been there 3 times and I'm considering moving there. But there are a lot of wealthy people and there is a lot of poor people (homeless people on the streets). Beside that it is pretty safe because they have law enforcement and some of their military stationed. Thanks for this, it helped a lot on my french project! This is a very good and useful website, has lots of info and everything is easy to understand. I would recommend it to you if you research on this topic. I really needed this for my french project! thanks! I was looking everywhere for any information about what kinds of food people in LUxembourg eat. This is the only website with that information!